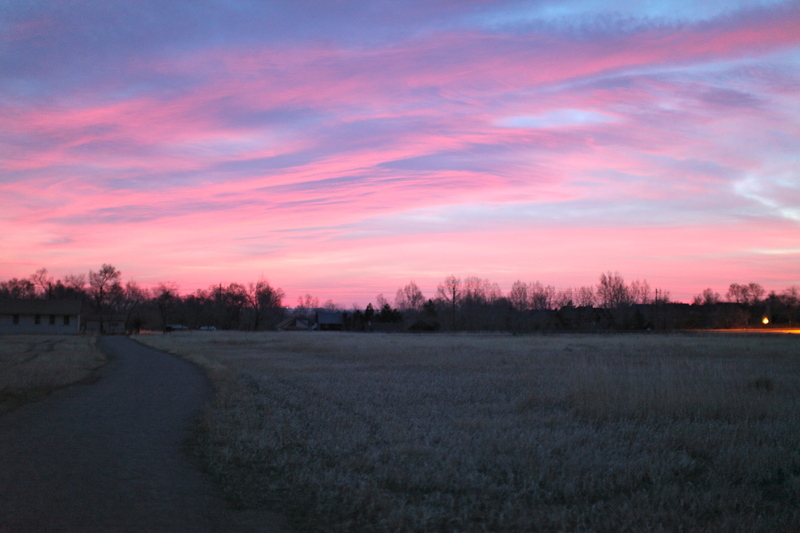 This week I set out simply to get up and see seven sunrises in a row as a change of pace from my normal routine of sleeping as late as I can get away with. Per usual with this project, it got me thinking about a lot of other things like whether I could become a morning person and whether I’m getting a good night’s sleep. I still don’t know that I’m a morning person but I know I would like to continue getting up some mornings to catch the sunrise. 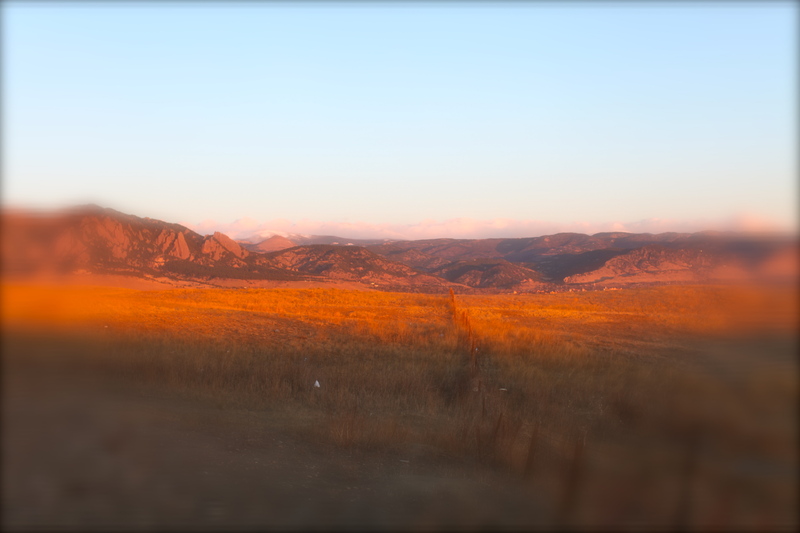 Boulder is a beautiful place and sunrise is arguably the most beautiful time of day to enjoy it. It’s quiet and peaceful. You have time with your own thoughts. As cheesy as it sounds it’s like you’re waking up with nature vs an “alarm”. There’s just something about it that makes the rest of your day feel manageable waking up that way. It reminds me of living in LA and driving home along the beach watching the sun set over the ocean. It puts your day in perspective and reminds you no matter how hectic the day can often be, there’s a pace that transcends it. Getting up early for a week forced me to examine some of my sleeping habits that I normally don’t really pay a lot of attention to. I realized I wasn’t really getting a good night’s sleep. 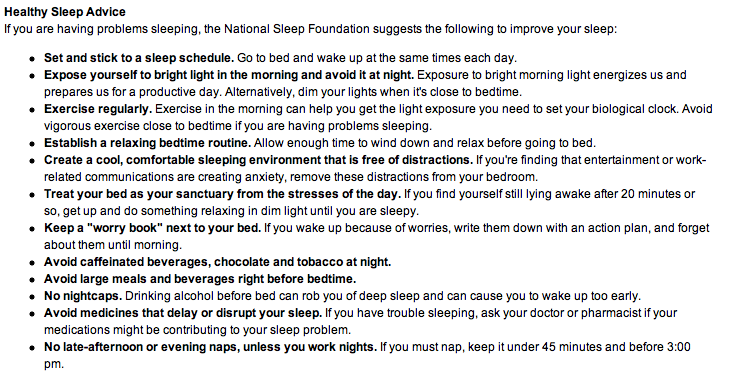 I learned a few things that I’ll keep doing to sleep better and therefore wake up feeling more rested. 1) relax before bedtime – no more web surfing, texting, stressful TV shows right up until bedtime. Instead bath time and reading. I’m excited about the new world of bath products I’ll get to explore! 3) no TV, iPad, mac or iPhones in the bedroom. Some people say it’s good to have a set bedtime and wake up time each day. I’m not someone who likes having a regimented schedule like that, but I do think after this week, I’ll get better sleep and naturally wake up to enjoy some beautiful sunrises. Now that I’m on my 5th day of waking up at sunrise, I thought I would try an experiment and see if I could wake up on time without an alarm clock. We banished all electronics from our room and gave it a shot. I guess my own internal clock must be working because I started waking up at dawn and then was out of bed right before the sun came up over the horizon. It was such a great feeling vs what normally happens which is that I’m jarred awake by an alarm clock & then have to listen to it repeatedly go off since my husband is a “snooze” person. The whole exercise got me thinking about alarm clocks and interested in learning more about where they came from. I think just even the name itself is pretty interesting, “alarm”. Not typically what you want to feel starting your day. In terms of its etymology, alarm comes from early 14c. from French alarme & Italian all’arme literally meaning “to the arms!”. It was extended in the 16c. to “any sound to warn of danger or to arouse”. Alarm clock is attested from 1690s (A Larum clock). Kind of interesting to think about in a modern context of getting up to go to work in the morning. When my husband and I tried to predict where alarm clocks came from, we both said it had to be the Germans of course. Right? Didn’t they invent being on time? We were wrong. Apparently alarm clocks can be traced back to the ancient Greeks in 400 BC who devised a water clock that would whistle or drop pebbles on a gong. Supposedly Plato used one. The next iteration seems to be the village clocks in Europe, which we actually heard when we were in France, signaling the start of the day. One of the most famous is the clocktower in St. Mark’s Square in Venice which was built in 1493 by Rainieri. 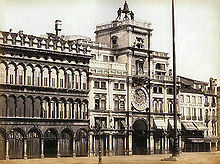 It signaled the start of day for the merchants of Venice. The alarm clocks we’re most familiar with, user-set clocks, also date back to 15th century Europe. 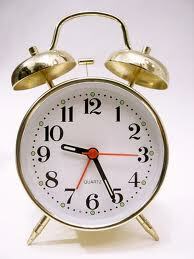 The first patented alarm clock was not the Germans but actually the French, believe it or not. 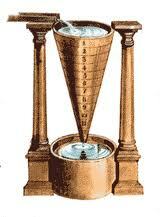 French inventor Antoine Redier had the 1st patent in 1847. So we have the French to thank for our timeliness. Oh, the irony. Another tidbit I found interesting occurred during WWII in the US. Like other consumer goods, production of alarm clocks shifted over to war work in 1942. This was probably the first evidence of the “alarm clock not going off” excuse because people had no new clocks to buy when theirs broke or became worn down. Many people would miss their shifts in the factories, blaming their alarm clocks being broken. Alarm clocks became one of the first consumer goods to go back into production before the war even ended to keep productivity on track. We’re pretty much familiar with what ensued from that point on. Just about any sort of alarm clock you could imagine was made from radios to personalized clocks, to snoozing clocks to sound machines to apps on your mobile phones. I’ll leave you with my personal favorite I found which was called the Tugaslugabed alarm clock from 1910. This alarm clock would literally pull you out of bed in the morning. You would place a loop around your toe and bolt the alarm clock to the floor. 8 seconds after the alarm went off it would start pulling you out of bed. I might have to track one of those down and try it on my husband! 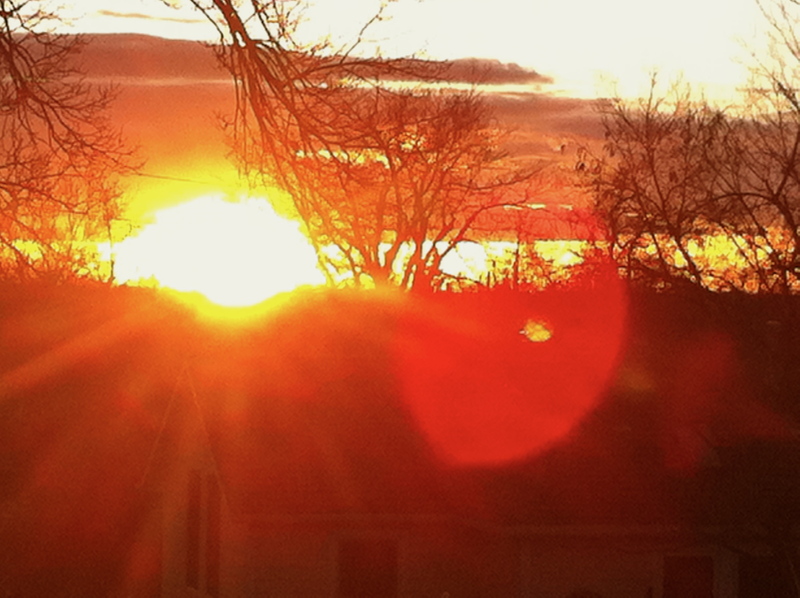 It wasn’t too hard to wake up for sunrise this morning because I had a pretty fitful night of sleep. I had all the good intentions of “early to bed, early to rise…”, but it didn’t work out that way. I was in bed by 9:30 so I could get up at 5:15 to go to a 6:00am yoga class with a friend. An hour or so later I woke up to my husband (as we say in the South “bless his little heart”) calling me to say goodnight from NYC where he was out with a friend. I tried to slide back into sleep, but my mind started wandering to different projects I’m working on and before I knew it I was wide awake, my mind racing. Then it was too warm to sleep and the wind started up outside which rattles the house it’s so strong. I knew I had to get up early and needed to get to sleep which made it even harder because it put even more pressure on sleeping. I feel for people who suffer from insomnia. There’s an old saying “a good conscience is a soft pillow”. I used to be a much sounder sleeper and in the last year I’ve been slowly getting better about it. It was hard for me to sleep for awhile when I went through my divorce four years ago. It was something I could never completely reconcile with myself, even though it was the right decision. That was then compounded by a high-pressured advertising job in LA where I always felt like I wasn’t doing enough. I got to a point where I was literally working in my sleep. This project inevitably gets me to look at things in different ways than I have before. Even when I know clearly what I want to do at the beginning of a week, as the week progresses it often leads me in different directions. I think as much as this week is about testing out the morning person side of me, I think even more so I want it to be a reclamation of wonderful, deep sleep. Maybe it’s time to officially put my conscience to rest. could I become a morning person? I’ve never been much of a morning person. Especially in the last few months I’ve been freelancing from Boulder, I’ve become even less so. It’s so nice to work from home and not have to get up and go into the office. I also like that I now get to sleep in later than my husband. I used to be the one to get us up. It’s kind of luxurious. Everyone has told us that will all change when we have kids, but for now I’ve been milking it. This week I thought it would be fun to test out whether I could get up and get going before sunrise for seven days straight. I also have some food & wine to work off from last week. This morning when the alarm went off at 6:00 I was tempted to shut it off and just do my backup plan for the week, but I got up while it was still dark out. I know 6:00 isn’t that early but I usually get up around 8:00, so it’s definitely much earlier for me. I drove over to Wonderland Lake for an easy stroll around the lake. 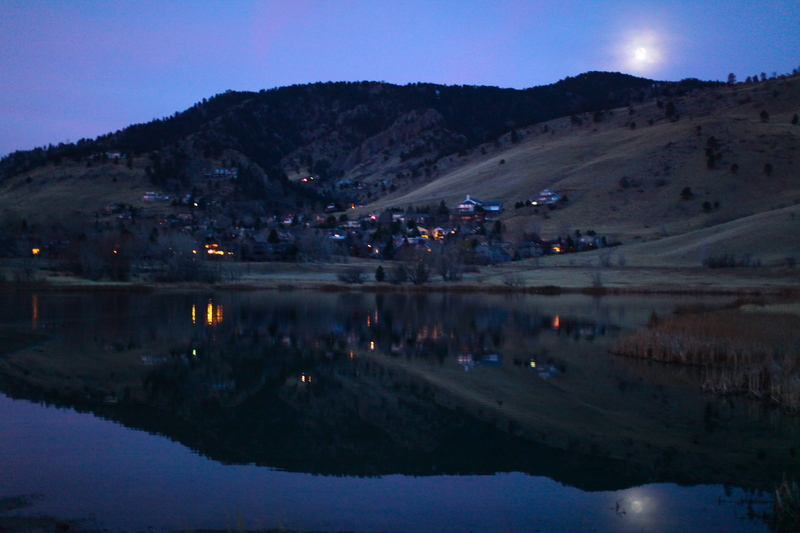 It was pretty stunning with the moon still out over the mountains and the sunrise opposite. 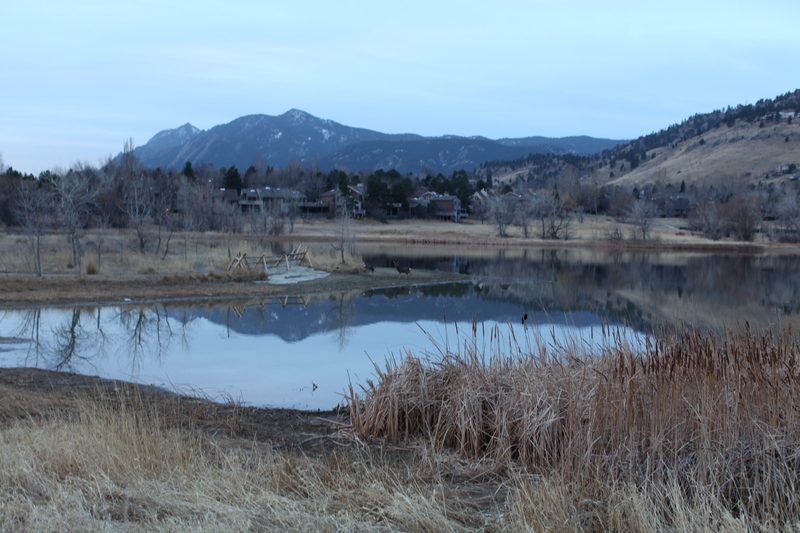 I was pretty proud of myself to be the first person out on the trail which is saying a lot in Boulder. It was so quiet when I started out and slowly all sorts of birds started chirping. It really makes it feel like Spring is here. 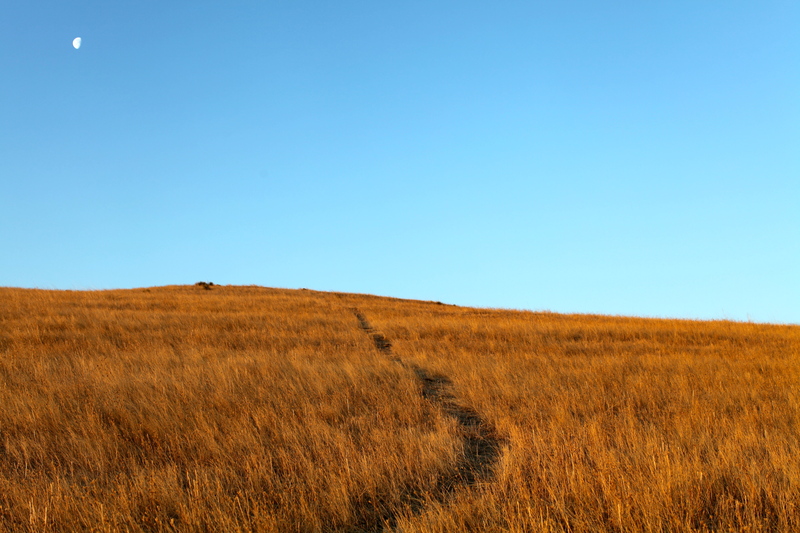 It didn’t take long to see people out running and traversing the mountain paths but it was still really peaceful. Another nice aspect of being up that early is seeing the wildlife. I got to see a couple of deer having a morning drink in the pond. Luckily I saw no mountain lions. It’s a pretty nice feeling to be up and outside before the world wakes up. 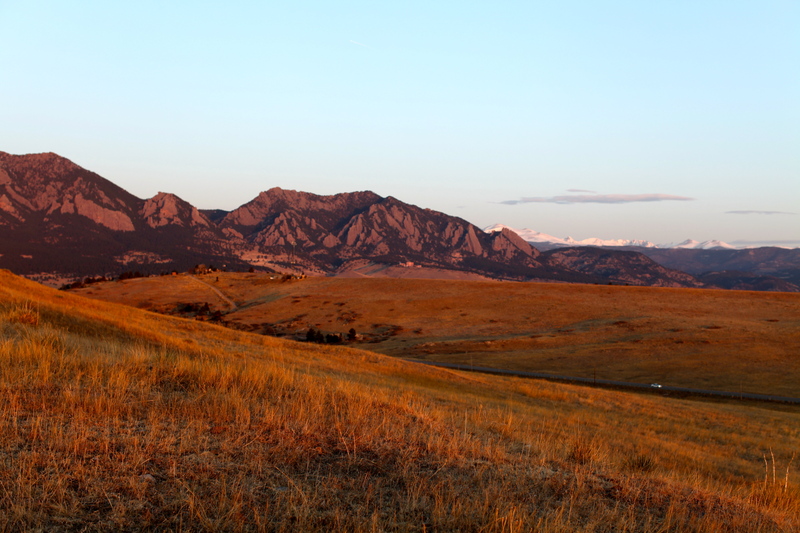 It’s also a beautiful time of day to see Boulder. If anyone has any favorite spots in the area to check out, let me know. I’d love to check them out. 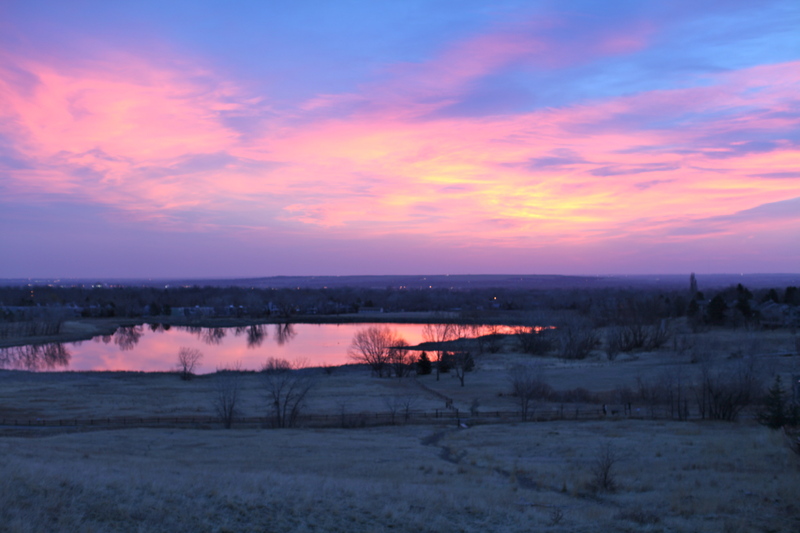 You are currently browsing the 12 seven sunrises category at 52 To Do.